At WBW Solicitors, we take pride in ourselves for our corporate social responsibility. We are glad to be fortunate enough that we can provide charitable donations to great causes such as the ‘Make a Will Week’ where we raised a whopping £9,165 for Rowcroft Hospice. We are also thankful that we have such vibrant local communities around us with a multitude of activities and events to get involved with, for example, the 2018 Torbay Half Marathon which we were recently a part of. However, we believe being socially responsible extends beyond the community and charity work that we do. We argue that in order to be truly socially responsible we must actively try to limit our impact on the environment. This is why we have considerably increased our efforts in environmental responsibility over the last few years. 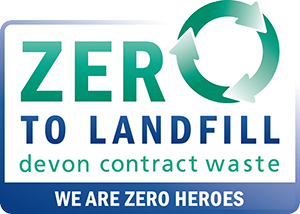 In order to offset our impact on the environment, we have been using Devon Contract Waste (DCW) for our waste removal services since March 2017 and print our business cards only on 100% Recycled paper. Devon Contract Waste are experts in commercial waste removal and more importantly, recycling. Recently, we enrolled in a scheme called ‘Zero to Landfill’ with DCW whereby not one single piece of waste that they remove from the offices goes into landfill. This has been made possible through a £4 million investment by DCW into a state of the art materials recycling facility in Marsh Barton, Exeter. This facility takes in unsorted mixed waste and through the use of a shredder, high tech optics and powerful jets of air, it separates the mixed waste into the different material types ready to be recycled. Any waste materials that cannot be recycled are sent to another plant to be burnt as fuel. As a result of this amazing process, DCW are able to truly live up to the claim that no waste goes to landfill. This Zero to Landfill scheme is just one example of WBW’s longstanding commitment to environmental responsibility. In addition, we hand out bags for life made from renewable and recyclable materials to all members of staff so that they no longer bring or buy plastic bags whilst at work. In addition, we also select our other waste removal providers carefully, for example, the company that removes our waste printer toner ensures that it is recycled as much as it can be. Couple this along with the fact that certain staff members walk, cycle or car share to get to work, it means that we are well on the way to reducing our footprint on the world. Unfortunately, this Zero to Landfill site is only one of a handful of its kind across the UK and much of the mixed waste that is collected by councils still ends up in landfill as they lack the funding to do anything different. This is why we are asking everyone to consider the impact on the environment of their actions and to take measures to limit their negative impact. To see what can be put into your recycling bags at home, check your local council website. For all your legal needs, contact WBW Solicitors LLP.